How to Protect Belongings On Beach When Swimming? 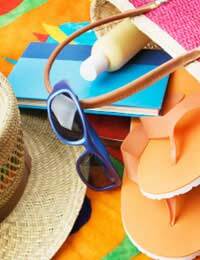 Home > Ask Our Experts > How to Protect Belongings On Beach When Swimming? I've done most of my travelling with friends but have just booked a month on my own in Costa Rica (mainly because of websites like this one). I have a question about being on the beach - any advice for protecting your belongings when going in for a dip and keys to hotel room etc? When we are holidaying we expect to enjoy our surroundings without having to worry about protecting our belongings and being mindful of strangers all of the time. Some destinations and locations however, will make us feel we have to maintain a certain level of alertness at all times, whilst other places – like the beach, watersports facilities or swimming pool area – allow us to relax with the minimal amount of concern. If we are spending time in the company of friends or family, keeping an eye on the security of your possessions is less of a problem. If, however, your activity is a solo excursion you will have to take sole charge for protecting your belongings. Limiting the amount of things that you take with you, to the beach for instance, will mean you have less things to keep your eye on, which will enable you to be less stressed. On the beach keeping your possessions dry will be your primary concern. Protecting your mobile phone, ipod or camera from sand damage is also a good idea. Ensuring you only take the essential items you need however, will mean you will be able to relax knowing that your belongings are safe. Therefore do not take too much money with you, and leave your credit cards safely stored in your hotel room / apartment safe or hotel safe. Securing your items in waterproof travel bags is a sensible idea. There are many different types of waterproof travel bags and pouches available on the market, so make sure you choose one that has an effective sealing mechanism. A neck strap is also a good option to consider as it allows you to carry your belongings whilst your hands remain free to enjoy a variety of experiences like scuba diving, canoeing, swimming or sailing. You simply pop your keys, mobile phone and money into the pouch, secure the sealant and loop the strap over your neck. This form of waterproof protection will also generally float, which means your belongings are less easy to lose if you accidentally drop them whilst you are enjoying water-based activities. As these travel bags are also reusable you can also use them to protect your belongings on subsequent land based travel pursuits and holidays. Any Tips for Teenager Travelling Alone to Australia? Do I Need Consent to Take Friend's Child on Holiday?